André Picard has been reporting on health and healthcare for The Globe for over thirty years. 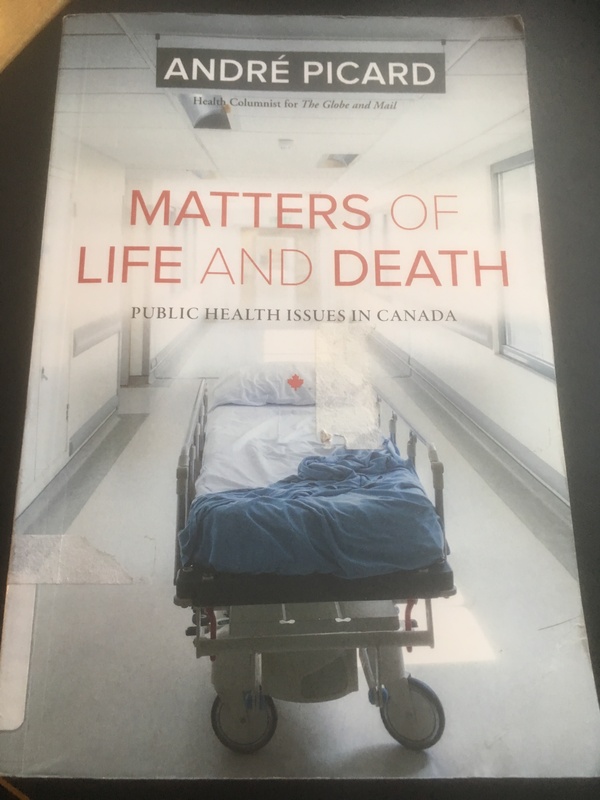 His book Matters of Life and Death: Public Health Issues in Canada is a collection of oeuvre from that period, focusing on some of the most important heath issues of that period and for Canada today. Apart from being a practicing psychiatrist, I did work for a time in health policy for the Canadian Medical Association and I haven’t quite shaken the habit. Mr. Picard’s book has become a reference for me and I am referring to it time and again when discussing or considering healthcare. The book is organized into fourteen sections on what are arguably the most important topics in Canadian Healthcare. Picard cites fourteen areas of healthcare that deserve immediate attention because of their impact on Canadians’ health and our health care system. These are Medicare, Mental Health, Drugs, War on Drugs, Aging, End of Life, Children, Reproductive/Women’s Health, Disability/Inclusion, Indigenous Health, Cancer, Infectious Disease, Lifestyles, Social Determinants. Each topic has its own chapter and the book is very readable and understandable even if reading about health and healthcare is not easy for the reader. As someone who promotes health literacy to the sixteen year old adolescents in my practice, this is important. The short articles in each chapter are interesting and well-written. Members of my team and I used Sip on this: Like all drugs, alcohol isn’t Consequence free for a group about alcohol use in teens. As I said before, this book has become a reference for me on Canadian Healthcare. I like to have good health policy information, to have the correct statistics and an impression of how others might be considering a health policy topic. Matters of Life and Death was accurate from these perspectives in those areas of health care where I have very good knowledge, which was always reassuring. Also, even when I don’t agree with his opinion, I can always see Mr. Picard’s point of view. This is the essence of good science journalism to me: that it stimulates dialogue and further consideration. I feel that Matters of Life and Death is a book that every Canadian who wants to understand the problems our healthcare system should read, but I also think they would enjoy it. I will also say that the most valuable information provided was found in the Introduction. Mr. Picard compiles a list of the shortcomings of health reporting. He cites a list developed by Gary Schwitzer, a well-known American health journalist, and then develops the list further. That list is a lens against which one can evaluate journalism on healthcare, a good tool to have when you’re trying to decide whether an article is worth consideration. A great resource. Thank you for the review.